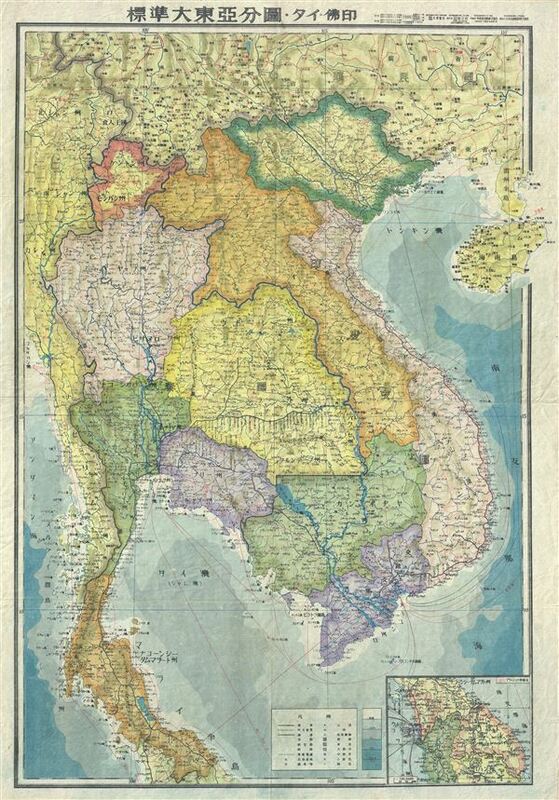 This is a beautiful 1943 or Showa 18 large format map of Cambodia, Vietnam, Laos and Thailand issued by the Japanese during World War II. The map offers superb detail regarding topographic features and notes cities, roads, and trade routes on air, sea and land. Shading is used to display oceanic depths. An inset in the lower right quadrant features the southern portion of the region. This map was issued shortly after the invasion of French Indochina by the Japanese during the Second Sino-Japanese War. The battle which took place in order to stop China from importing arms and fuel through French Indochina would result in the Japanese capturing the northern regions and defeating the Vichy Regime. All text is in Japanese. This map was created as part of the Series of Great East Asia maps prepared by the Japanese during World War II.